Alien Readers are built for challenging environments that commonly appear in the real world. Robust, tough, and high-performing for even the most challenging conditions. Alien readers come with advanced filtering and intelligence which benefits users with less network traffic, fewer additional pieces of network equipment, lower setup, and lower maintenance costs. 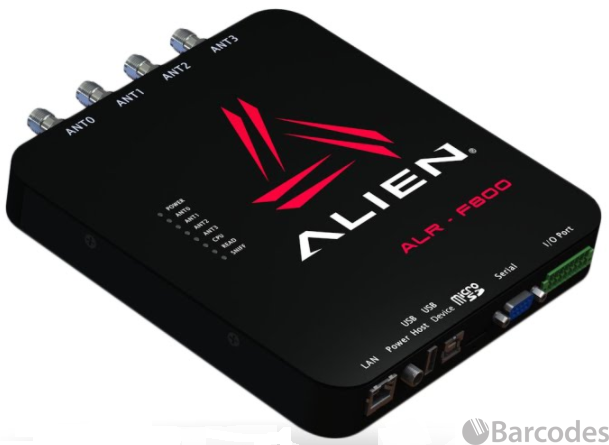 The ALR-F800 is Alien’s self-optimizing enterprise RFID reader. With a discrete architecture that intelligently adapts and configures based on its environment. The ALR-F800 has the industry’s best Power over Ethernet transmit power and performance. The ALR-F800 has the flexibility for system enhancements and future proofing such as the industry standard MicroSD and USB slots for adding memory along with additional capabilities such as Wi-Fi, Bluetooth, and cellular. Global EPC Gen 2 platform. DSA (Dynamic Self-Adapting) real-time read optimization. Power source agnostic and auto-switching. Dynamic Authentication of Higgs ICs. Automode, with on-board state machine. High read rates for demanding applications. Enhanced noise rejection for reliable data capture. Supports extended / custom Higgs IC features. Auto “Seek” function for low duty cycle applications. Plenum Rated (EAHS) per UL 2043. The ALR-F800-X builds on the ALR-F800 with a revolutionary solution that simplifies RFID infrastructure installation, operations, and maintenance. 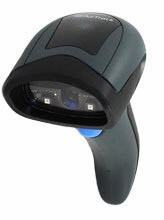 Combines an Enterprise RFID reader and edge service to provide multiple-reader visualization and management. 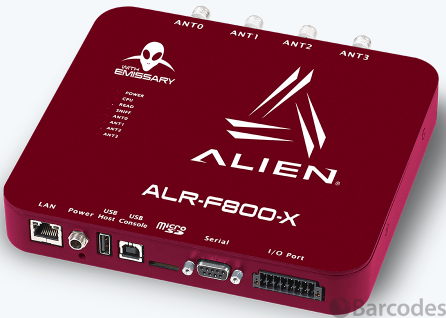 The ALR-F800-X comes with emissary which is Alien’s multi-reader configuration, management, and work-flow description solution. This means users can create names for each reader instead of using the standard serial number that a RFID reader normally identifies by. Making the management of multiple readers easy. Reader + Multiple Reader Configuration and Management in one device. Class leading Global EPC Gen 2 4-port RFID Reader. Same footprint as Alien’s ALR-F800 UHF Enterprise Reader. Built in handling of common chores. 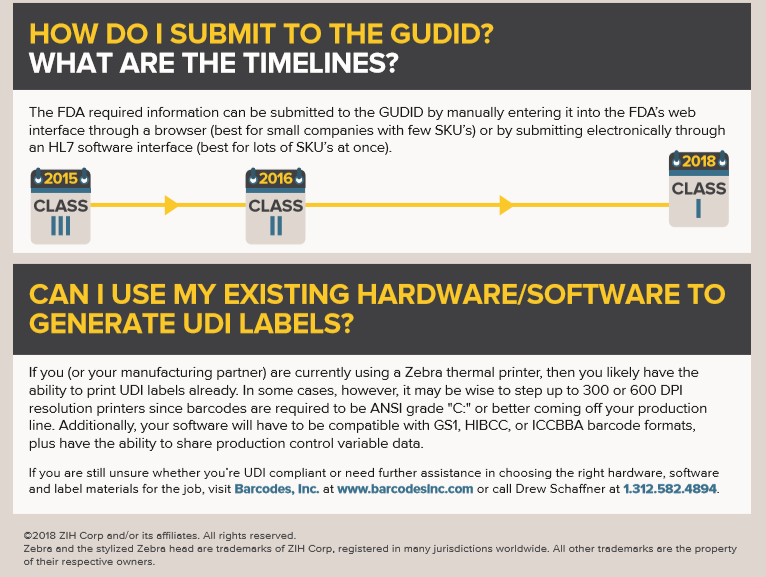 For any questions or a quote on any of your RFID needs, please contact us at Barcodes, Inc. The Electronic Logging Device (ELD) Mandate took effect on December 18, 2017. Since then drivers were given some leeway. If they were caught without the proper ELD equipment, documents, or training they were written up, but neither they nor the companies they drive for were penalized for it. That leeway officially ended on April 1st. 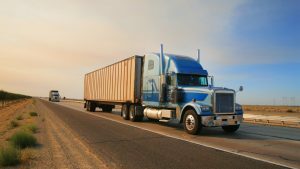 Under the Compliance, Safety, and Accountability program (CSA) any driver now caught without the proper ELD equipment will have CSA points levied against them and their companies. Furthermore, according to Kerri Wirachowsky, Director of the roadside inspection program at the Commercial Vehicle Safety Alliance, trucks will be put into the penalty box, in most cases for up to 10 hours. With the ELD Mandate drivers must have and be able to do the following. Tell enforcement that there is an electronic user manual with instructions for using the device, on the device, in the form of help screens. Be able to produce recent data and transfer it to an inspector electronically. Instructions for reporting malfunctions and record-keeping procedures during malfunctions. Have at least an eight day supply of blank forms for recording a driver’s hours of service in the event the mobile device fails. April 1st has come and gone, hence if drivers are not ELD compliant by now its important to do so. Mainly because just having an ELD does not mean the driver is in compliance. The driver must also be able to operate the ELD. Not being able to do so will be treated as if the driver didn’t have the proper equipment on board. Klaus Schwab founder and executive chairman of the World Economic Forum once said, “In the new world, it is not the big fish which eats the small fish, it’s the fast fish which eats the slow fish.” His words ring true, especially in today’s technology dependent world. Either move forward or get left behind. Zebra Technologies does a great job explaining this revolution with, Transform Your Organization By Harnessing the Workforce Mobility Revolution. You’ll learn what this revolution looks like and the benefits it can provide to your organization. To fully realize the potential of workforce mobility your organization will need advanced mobile operating systems, mobile devices, and software solutions. Redefine how your organization gets things done by implementing faster and smarter processes that help propel your organization forward. Productivity: From the use of advanced operating systems, devices and purpose-built software applications that speed up workflows. Efficiency: Via processes that eliminate waste or complexity. Accuracy: With advanced data collection capabilities that reduce the soft and hard costs associated with errors. To read the full white paper by Zebra Technologies, download your copy HERE! To help improve your organizations Workforce Mobility please contact our dedicated account managers for mobile solutions! Tech Tip Tuesday the End of Legacy OS Support: Are You Prepared? Most ruggedized handheld devices are powered by legacy operating systems. The problem, the extended support for legacy OS is quickly approaching its end. For infrastructure and operations leaders responsible for mobile and endpoint strategies it’s recommended to stop buying equipment with legacy OSs and begin planning their migration strategies. In Gartner’s report, Revisit Your Ruggedized Strategy Before You’re Hit by the End of OS Support, industry analysts, Leif-Olof Wallin and Stephen Kleynhans go in depth on how to overcome key challenges and their recommendations for planning a strategic migration. Their research is based on a large number of inquiries with clients, as well as discussions with technology vendors. Explains what to stop buying and where to focus planning. Evaluates the business case for ruggedized equipment, based on actual requirements and a fully loaded total cost of ownership calculation. Outlines when to standardize versus when to diversify the ruggedized device portfolio. 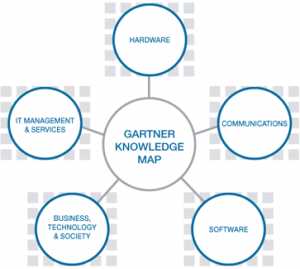 Describes how to protect current investments in software and systems with application virtualization technology. To download and read the full Gartner report please click HERE. Any questions concerning the end of legacy operating systems please contact our dedicated account managers. 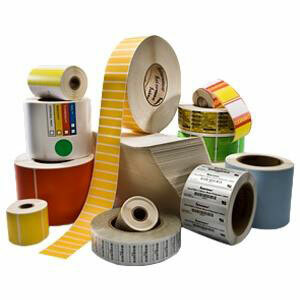 There are a variety of options when it comes to consumables. Whether it be receipt paper, wristbands, labels, or tags each and everyone has their benefits when it comes to maintaining your printer. Printing supplies can impact everything from the printhead’s lifespan to the printer’s operational efficiency. It’s an important decision when it comes to maintaing the lifespan of your printer. Duratherm and Duratran products are easy to use and demand less user intervention. 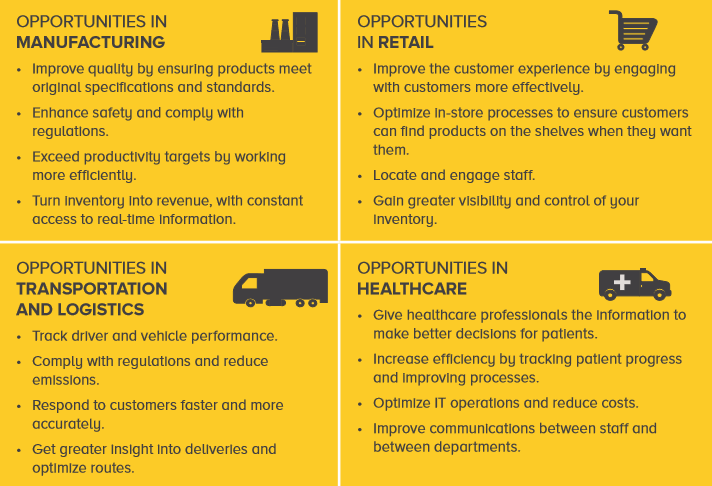 There are no shortage of options to pick from and you can choose what best fits your application whether it be healthcare, shipping, inventory tracking, general purpose, or etc. Today, April 22, is Earth day and it’s time to return the love to the planet we all call home. Thanks to Global Technology Systems (GTS) they will be providing a Lithium-Ion Battery Recycling program. You may be asking yourself why do I need to recycle my batteries? Well, Lithium-Ion batteries consist primarily of chemicals and metals which in turn allow the battery to hold a long charge and remain light at the same time. These chemicals and metals consist of lithium, cobalt, and other materials that can be extremely harmful to the environment we live in. The improper disposal of these batteries as trash leads to water contamination, soil contamination, and among other things negative environmental/health outcomes. 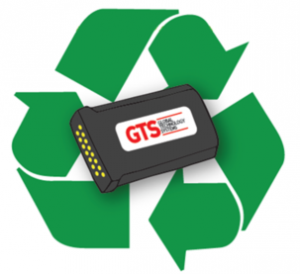 GTS will provide customers involved in the program with free battery recycling boxes at each enrolled facility. Once the battery recycling box is filled, simply call the toll-free phone number on the box and it will be picked-up and properly disposed of by a GTS-certified recycling firm. Once a recycling box has been provided to the recycling firm another recycling box will be provided to continue this free service. Help make our Earth a better place to live, recycle the batteries that help power all of your mobile operations. For more information on how to start recycling those Lithium-Ion Batteries please Contact Us! To go along with yesterday’s blog about Unique Device Identification Compliance some may be wondering what is required to be fully compliant with the FDA. 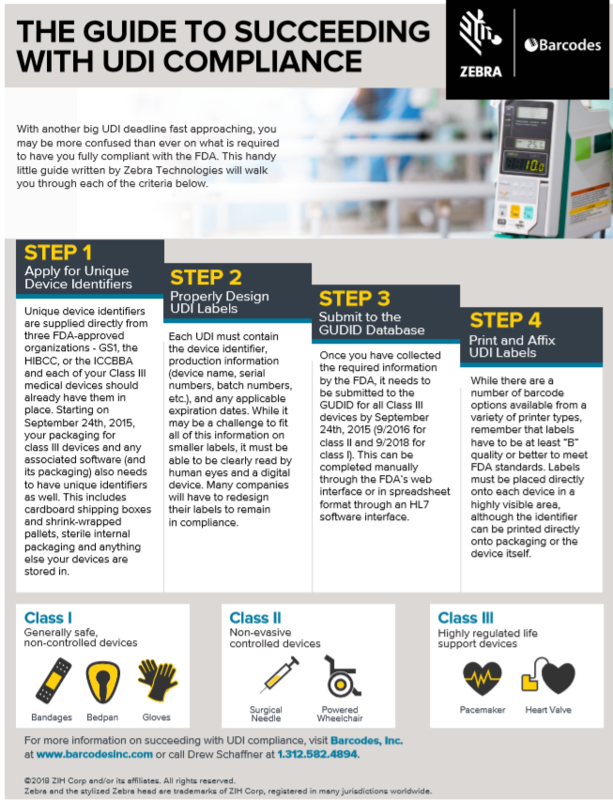 With another UDI deadline approaching it’s important to know the steps that will help you get in compliance. With the help of Zebra Technologies, they wrote a small walk through to help you through each step. Read the walk through below to clear up any confusion. If you have any further questions please don’t hesitate to contact our dedicated account managers. 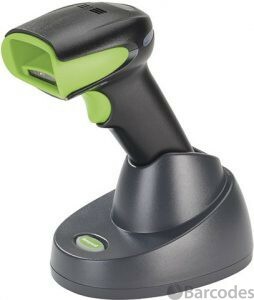 The Food and Drug Administration (FDA) has established and continues to implement a unique device identification system to properly identify medical devices through their distribution and use. Once fully implemented, the label of most devices will include a unique device identifier (UDI) in human and machine-readable form. The unique device identification system will be phased in over the next couple of years and offers several benefits. Implementing UDI will improve patient safety, modernize device post-market surveillance, and facilitate medical device innovation. 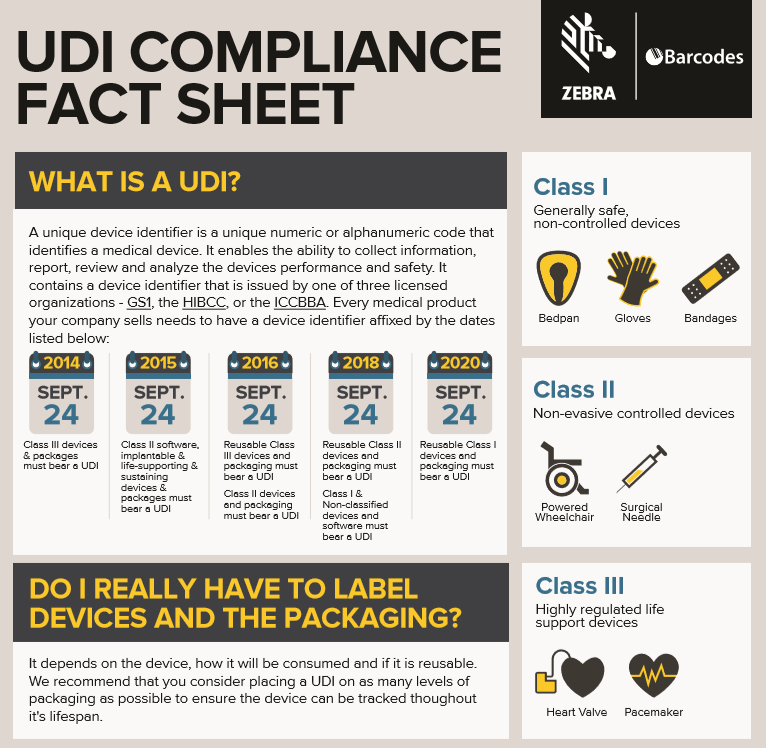 To learn more about UDI read the infographic below! If you want to learn more, feel free to contact our dedicated account manager. It might be kind of hard to choose the right scanner to use. So to make things easier below is a flow chart with recommended scanners to find out what kind of scanner will work best for your application. For corded scanners, the main questions are what type of barcode do you need to scan and what kind of environment will you use the scanner? 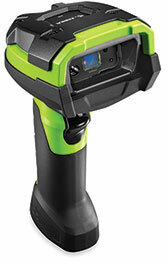 Which, will ultimately determine if you need a rugged or a non-rugged scanner. If you are still unsure about what type of scanners you need feel free to contact our dedicated account manager and we will be happy to help.